For decades, Native American students have been forced into Anglo-American educational systems and given little room in the classroom to become educated about their own culture and traditional history. 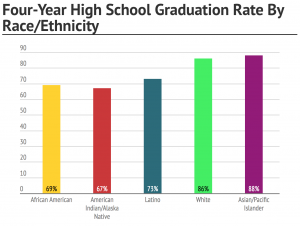 Today, Native American youth have the lowest achievement scores and graduation rates of any other ethnic group in the country. In 2014, studies showed that 67% of Native American students received a high school diploma as compared to the national average of 80%. 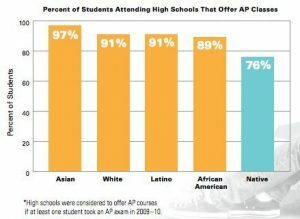 Additionally, only 17% of Native American students go on to receive a college diploma. Native American school facilities are some of the most run-down, neglected schools in the country. They lack the funding that many other schools receive, contributing to the difficulties and hardships that bog these Native American youth down as they go about their everyday lives. Factors such as high levels of poverty also create educational barriers that students have no control over. They lack the basic resources and educational opportunities that many other schools across the country have. These resources can include textbooks, school supplies, equipment, scholarship and internship opportunities, and high-level high school classes. Another factor that contributes to the failure of Native American students in schools is that since the late 19th century, their culture, language and tradition has been oppressed in educational institutions. For generations, they have been taught that they should not be proud of who they are. Their history has been silenced, they are taught to be ashamed of their differences, and they have been forced to conform to “American” ideas in hopes of civilizing these students. Years of oppression that these youth face both inside and outside of the classroom damage their confidence and sense of self. They are taught not to be proud of who they are and where they come from, increasingly adding on to their confidence and insecurity issues, and feeding them doubt that they will never succeed. With all of these factors weighing on them, these statistics are not surprising. Due to the large number of Native American tribes and Reservations in Seattle and the Northwest Pacific, families and youth in these areas have faced much of the oppression that I have touched on in the paragraphs above. Though the grassroots organizations that I have researched were founded and remain in Seattle, South Dakota, and Oregon. Although the majority of my research on these grassroots organizations was done in this region, Native American Reservations and youth across the country experience the same troubles and oppression on varying scales. As you’ll see throughout the rest of my website, I will attempt to show the ways that these grassroots organizations work to get rid of the problems and hardships that these Native American students and youth face in their everyday lives.